Hey everyone, meet Heidi! She is my new BFF! One of the biggest surprises for me about blogging has been "meeting" such wonderful people from all over the world. My Mr. A calls them my "invisible friends." 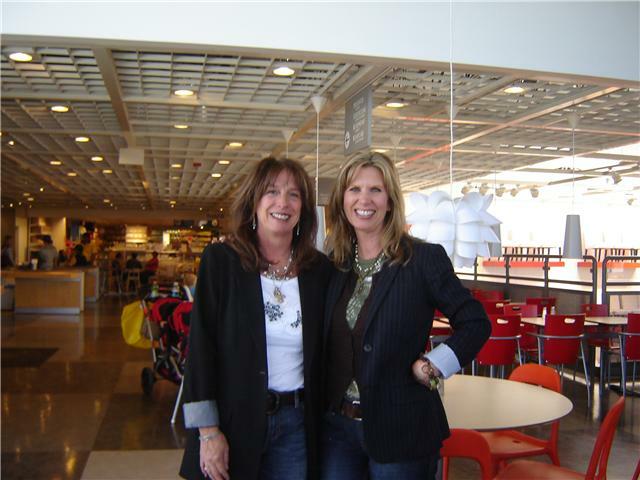 Well, last week, I met Heidi from Heart and Home and she went from "invisible friend" to real live friend! How cute is she! Heidi's blog Heart and Home is just beautiful. I have been following her for quite a while, intrigued that she lives on the redwood coast of Northern California. When we found out we lived somewhat close to each other, we started emailing back and forth. Eventually, we agreed to meet for lunch.We decided to meet at Ikea, since it was halfway between our homes. Above is Heidi taking a picture of me, taking a picture of her! Seriously, we had such a great time. It was like I have known her for years! 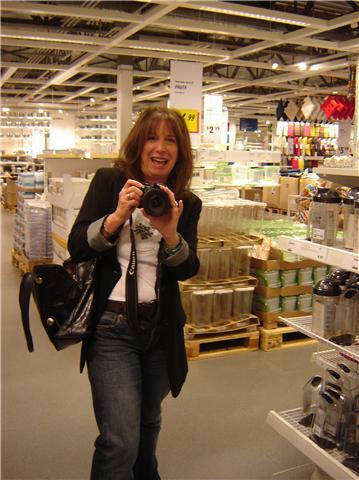 We shopped Ikea and talked the entire time about blogging and how it has enriched our lives. 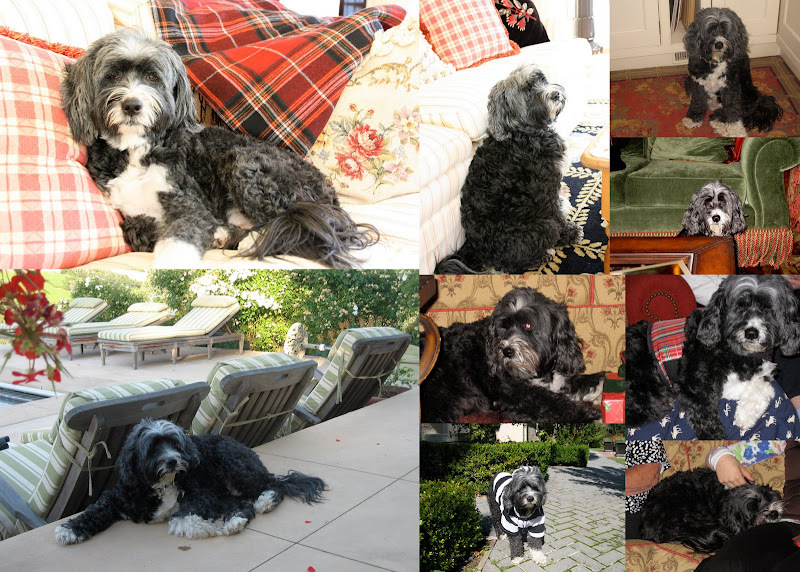 We found that we share the same passion for interior design, gardening, family and home.We had so much in common. We even dressed alike! Same jeans, boots, tee shirts, boyfriend blazer and jewelry! Similar hair too! 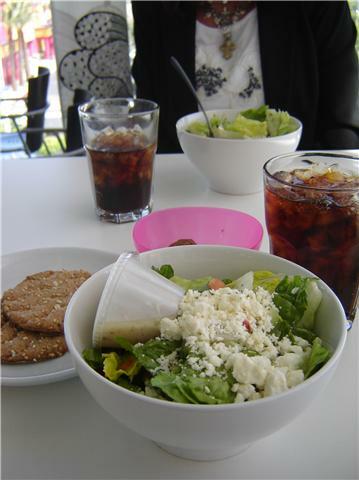 For lunch, we each had a delicious Greek salad and Diet Coke at the Ikea cafeteria and continued talking even more! We wanted to come up with a plan to blog about our meeting and what we purchased at Ikea. So, while shopping in the dish section, we decided to purchase something that would inspire each of us to create our own Ikea inspired tablescape for "Tablescape Thursday." I found these two cotton stripe rugs for $5 each. I wasn't sure what I wanted to do with them, but was thinking "table runner." Then I found a package of four stenciled cork placemats. I ended up layering them on the rugs which I placed across the table. Now....what plates to use that would tie in with them both. So in the spirit of our Ikea (bargain) tablescape challenge, I searched for very inexpensive dishes at my usual haunts. My first choice are these plates which I found at Ross. $16.99 for a 20 piece set! I like how the black toile and red rose pattern tie the Ikea placemats and rug together. I already had the numbered napkins (Pottery Barn) and galvanized pots. I was lucky to have the fresh ivy plants after a shopping trip to the wholesale nursery for a client. Wholesale is good! I bought this darling ivy birdcage and used it as the centerpiece. A bird's eye view of my "Ikea Inspired Tablescape!" Just for fun, here is my second choice. I also found these plates at Ross. Aren't those salad plates cute? Don't worry, I will use them. I'm staging a house to sell and will end up using these plates in a garden room by the pool. Now, go over to Heidi's at Heart and Home and see her "Ikea Inspired Tablescape." It is absolutely darling! Don't forget to leave a comment and tell her Delores sent you! We are both linking up to Susan at Between Naps on the Porch for Tablescape Thursday. I'm also linking up to Heidi at Heart and Home for her weekly Wednesday Gratitude because I am very grateful to meet her and call her friend. On Friday, I'm linking up to Cindy at My Romantic Home for Show and Tell Friday. Last weekend in the wine country was absolutely gorgeous. The temperature was in the upper 80's and Spring was definitely in the air. We spent the day on Saturday cleaning and getting ready for the warm months to follow. Of course I had my camera at the ready, trying to capture the gloriousness of the day. We ended up doing a lot of "spring cleaning." All the lanterns under the pool house, as well as the barbeque and sink area got a good scrubbing. During the winter, mice got in under the cabinets, so that was a job to clean up too. I guess that's a fact of life when living next to a field! While Mr. A was scrubbing the barbeque, I wanted to do something fun, so I put a tablecloth on the table and staged it with lanterns and an old grain sack that I found in Texas. Dexter and I felt like exploring, so we decided to walk down to the edge of our property and check out the new growth on the vines in the neighboring vineyard. Just a month or so ago, there were no leaves on the vines. How beautiful are these Cabernet Sauvignon vines and the wildflowers growing below? They belong to Rodney Strong Vineyards. Walking back, Dexter and I noticed how the fields are full of wild flowers like these wild sweetpeas. .....And the pool and main house. Time to get back to work! We harvested all the Spring garlic and planted some vegetables like these heirloom tomatoes. What a job! The soil needed to be amended, so there were a lot of wheel barrel trips back and forth with fresh soil. I hope the squash grows. Last year, I planted too late and didn't get one squash! Here is our raised bed garden outside the kitchen door. I found these bamboo teepees at Orchard Supply last year and they make great tomato cages. We ended up planting four heirloom tomatoes. Looking from the pool house toward the raised bed garden is this flower bed. I planted about ten hollyhocks in here next to the existing roses and sweet alyssum. Looking up, I see a parachuter gliding down over the oak tree. I can hear the screams of fear and exhilaration from above! There is no way I will ever do this! My feet are firmly planted "terra firma!" This view is my exhilaration! This is a great place to be inspired by beautiful outdoor photography, so check it out! I have always been drawn to still life paintings, especially ones that depict both fruit and flowers together. This Vernon Kilns plate is a great example. It's called "Fruitdale." .....and this antique French confit pot as a centerpiece. I found this pot in Houston and hand carried it on the plane home! The flowers are yellow and white Gerbera Daisies and Sunflowers. Little clay pots of herbs compliment the rustic setting. These glasses compliment the colors in the plate. The bowl is light green, the stem purple, and the bottom is amber. The teapot to this pattern is quite lovely with the little flower on the lid. Faux bamboo silverware adds to the overall French theme. This built in hutch is adjacent to the table. One of my favorite still life paintings of fruit and flowers leans against the back. A rustic French bowl holds various grapes. Moving the bowl next to the confit pot, I tried to create my own still life. Voila! Still Life With Fruit and Flowers! It's Tablescape Thursday again! I'm linking up to Susan at Between Naps on the Porch. On Saturday, I'm linking up to Laurie at Bargain Hunting With Laurie for Favorite Things Saturday. Be sure to visit these three blogs to see what the other participants are featuring.